Expanded steel is a high-strength, economical choice for infill panels. It’s formed by a series of presses that die-cut and expand the raw sheet metal to create a diamond pattern. Metal can be expanded up to 10 times its original size, creating a product that weighs 80% less while retaining its fundamental rigidity and integrity. Expanded metal offers a number of advantages over other materials. Because it is formed from a single piece of metal, there are no welds or weak points, which makes it exceptionally structurally sound, with a high strength-to-weight ratio. Unlike perforated metal, there’s no waste involved in producing it, which also makes it cost-effective. Expanded metal infill panels have a distinct look that can complement certain architectural styles. Our products can be finished in a number of different colors for maximum design versatility. Standard, or raised expanded metal infill panels are pressed, cut and expanded, leaving sharply angled knuckles where the individual strands meet. Flattened expanded metal undergoes an additional cold rolling process, creating a smoother surface and a finished product that is about 5% lighter than standard expanded metal. Expanded metal grating, a heavier-duty product that is not usually used for infill panels. It’s made with a thicker gauge of carbon steel. Typically, its use is reserved for more demanding industrial applications. 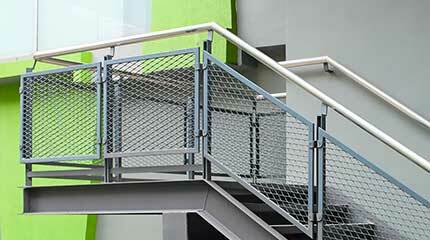 Expanded steel railing infill panels can be made from any of the above materials. Our products are offered in different gauge stainless steel as well as several other metals, with a range of hole sizes and shapes. Our fabrication process is extremely flexible and filled with options for customizing your purchase as necessary. Marco Specialty Steel will fabricate any order of expanded metal infill panels to your specifications. We are unique in our ability to quickly turn around projects of any size for demanding customers. We can work from an existing blueprint or help you determine your needs to create a custom design. In everything we do, an exceptionally high level of quality control is ensured. To get started or to request a quote, call or use our online contact form to get in touch with a representative directly.